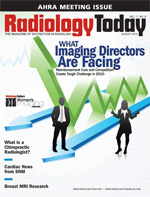 Reduced reimbursement is a problem across radiology but not the only challenge. Imaging directors share some steps they’re taking to offset cuts and overcome other obstacles. When Radiology Today asked imaging directors about the No. 1 challenge they’re facing this year, it was no surprise when they responded that reimbursement cuts are their biggest problem. In other words, it’s the imaging economy, stupid. The traditional management response to reduced reimbursement is to compensate for the difference by performing more exams. But some readers also told us that their facilities are facing both stiff competition and soft volume because of the slumping economy. Competition and the soft economy have many facilities marketing aggressively in an attempt to offset reimbursement cuts. Not surprisingly, several imaging directors told us they’re increasing their marketing efforts in an attempt to increase volume; those readers also noted that it’s too early to tell whether they’re achieving any significant results. One director told us that his hospital was creating more slots for outpatient imaging exams by scheduling more inpatient exams between midnight and 8 am. Another said his facility is focusing its marketing efforts on showing referrers the value of its service in hopes of securing the referrers’ business. Still another organization is working with a consulting organization to increase its patient satisfaction to solidify its businesses. One facility director said his organization is looking to self-insuring some of its service contracts as they come up for renewal, assuming more risk to cut costs. • Imaging directors report that the increasing requirements for exam precertification are a growing burden. More insurers are requiring prior authorization for imaging studies, creating a larger administrative burden on the front end of the imaging revenue cycle. An imaging director in western North Carolina said preauthorization has become such an issue that his department created a team to handle preauthorization requirements before patients come in for exams. He added that the precertification program has helped reduce the denial rate in the system’s hospital and outpatient imaging centers. Another imaging director reported some success in reaching out to referring physicians to explain the details of the preauthorization requirements of the key insurers the referrers’ practices work with regularly. • Some readers told us that their hospitals’ primary challenge this year was funding for capital purchases, which is consistent with an environment of reduced reimbursement and spotty volume growth. • One imaging director reported that patients are expressing concern about radiation exposure from CT scans. In response, he said the practice developed a marketing campaign to address radiation dose concerns and purchased dose-reduction engines for their CT scanners. • A director reported his facility was having problems with its interventional radiology billing, leaving earned reimbursement on the table. It’s attempting to solve the problem by hiring a seasoned interventional radiology tech and a certified coder to tighten coding claims. • Only one imaging director mentioned having problems with hiring technologists. The technologist shortage appears to be a memory in most places. So what challenges are you seeing in your facility? More importantly, what are you doing about it? Share you solutions and ideas on our Facebook page or e-mail them to RTeditor@gvpub.com.